Like all insects, bumble bees have small brains with a much simpler appearance than a human's. Researchers have discovered that despite these facts the insects have some surprising mental abilities. Experimental evidence indicates that bumble bees have the ability to solve quite complex problems, generally after receiving training by humans or after observing other bees solving the problems. They can pull a ball along a path and into a goal. They can also pull an inaccessible disk towards them with a string. The insects learn from one another and may have a rudimentary culture. They may even experience a sensation resembling optimism. The terms bumble bee (or bumblebee), humble bee (or humblebee), and dumbledore are all names for the same insect. The last name is rarely used today and the second name is uncommon. Bumble, humble, and dumble all refer to the humming, buzzing, or droning sound made by a bee in flight. Bumble bees belong to the genus Bombus. 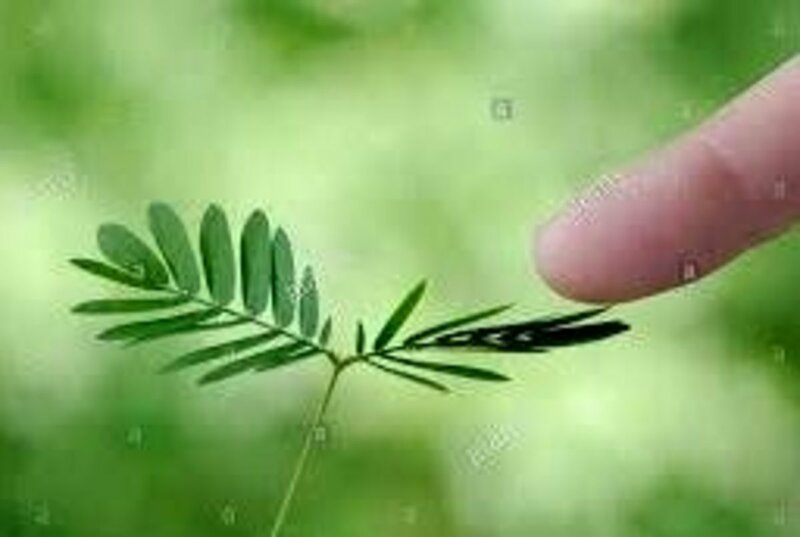 There are around 250 species in the genus. Many are social insects, but some are solitary. Most live in the northern hemisphere. A few species inhabit South America, however, and some species have been introduced to New Zealand and Tasmania. 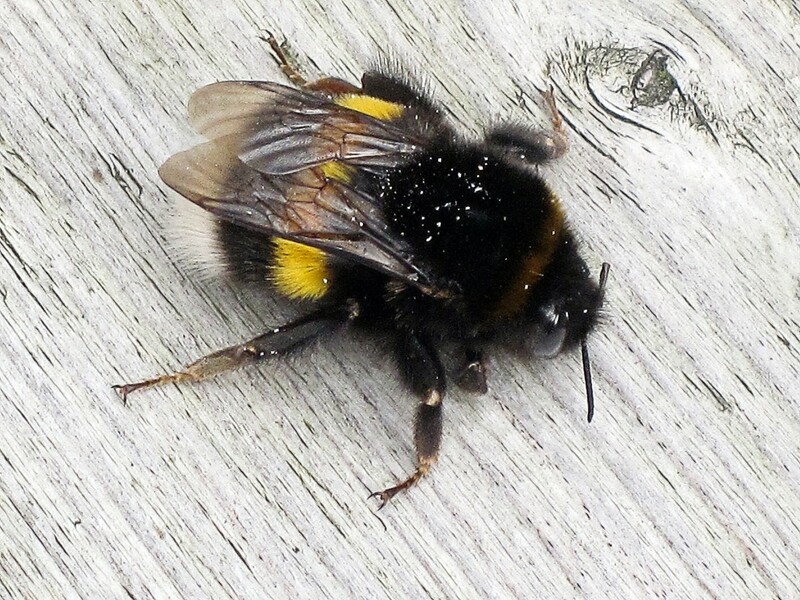 Bumble bees often have stout bodies. They also have a furry appearance, which endears them to some people. Their hairs and other body adaptations allow the insects to be active in much colder conditions than other bees can tolerate. The bees can sting and may do so defensively, but I find them much less bothersome than the yellow jacket wasps in my area. I've never been stung by a bumble bee, but I have been stung by a wasp. 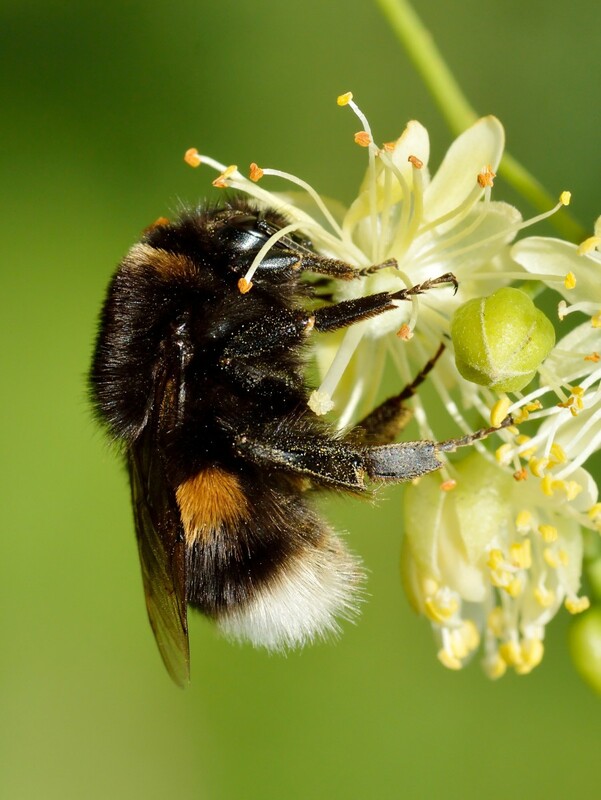 The species used in the studies described in this article was the buff-tailed bumble bee, or Bombus terrestris. It's one of the most common bumble bees in Europe and one of the most widely studied. A honeybee has a barbed stinger and dies after stinging a human. A bumble bee has a smooth stinger and can sting multiple times without being harmed by the action. The drones don't sting, however. In early spring, the queen bee emerges from her underground location. During the winter, she hibernated in a small cavity called a hibernaculum that she dug herself. The newly-emerged queen visits the first flowers of the year to feed on nectar and pollen. Once she has built up enough strength, she establishes a nest. The nest may be located in an old rodent burrow or in a location above ground, such as in a patch of dead grass. The queen lays eggs that become females known as workers. The workers take care of the nest and its inhabitants and gather nectar and pollen for the colony. 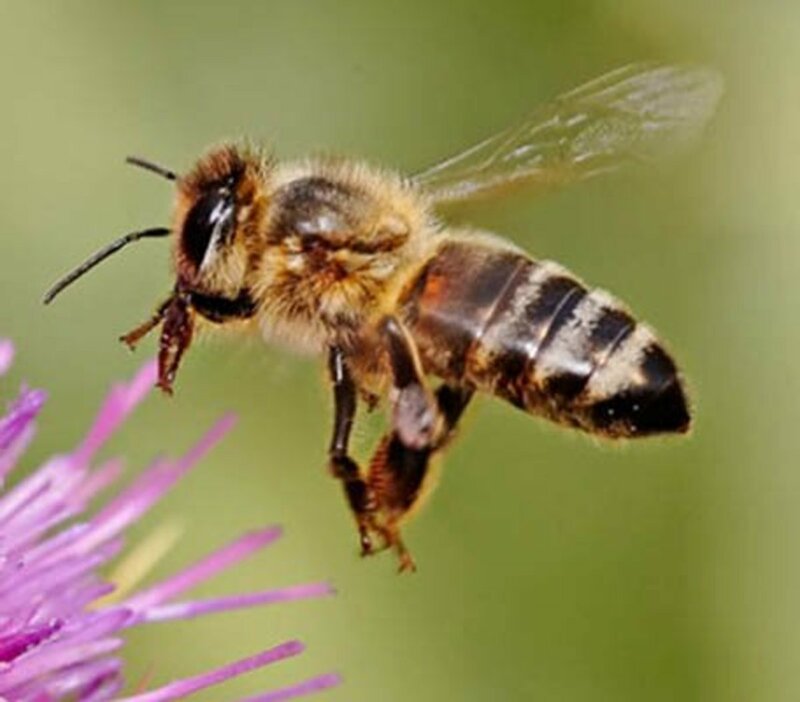 Like worker honey bees, they have pollen baskets on their legs where the grains of pollen are temporarily stored. 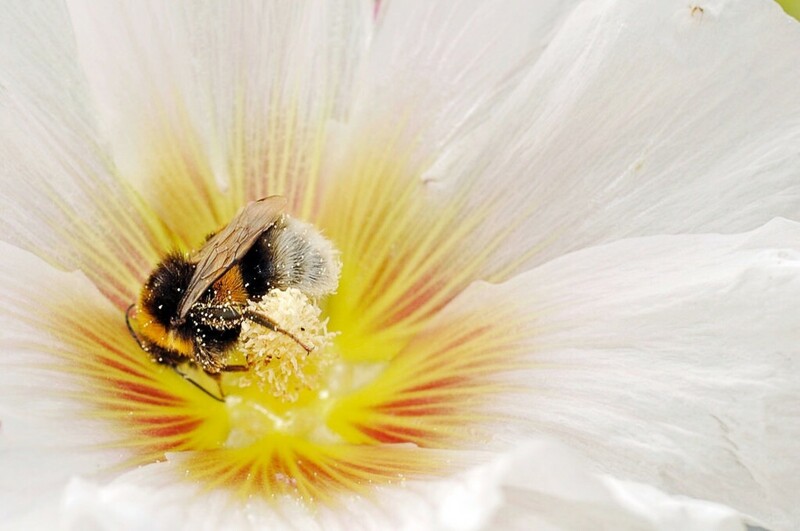 As the workers travel from one flower to another, pollen grains become temporarily stuck to their body and are deposited in other flowers when the bee visits them. The worker bees therefore act as agents of pollination. The workers do make honey, but they produce much less than honeybee workers. They are not sterile and lay eggs under certain conditions, though normally only the queen reproduces. The workers are the life stage that has been used in behavior experiments. Near the end of summer, drones (the males) are born from unfertilized eggs and new queens are produced from larvae that are fed a special diet. The drones and new queens leave the colony to find mates. The old queen and her workers die before winter, as do the drones. Only the new queens survive to start another colony in the following year. Almost 80% of all flowering plants depend on pollinators to help them transfer their pollen. In the first part of the twentieth century, the buff-tailed bumble bee was known as the large earth humble bee and the buff-tailed humble bee. 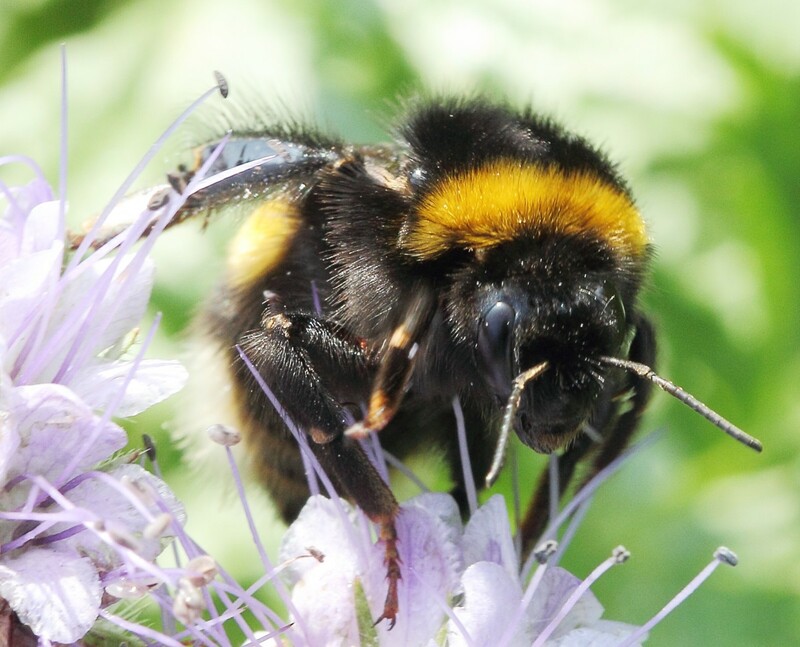 Researchers at the Queen Mary University of London have performed several interesting experiments related to the learning capabilities of bumble bees. In 2017, they studied a behavior that they call bee soccer. 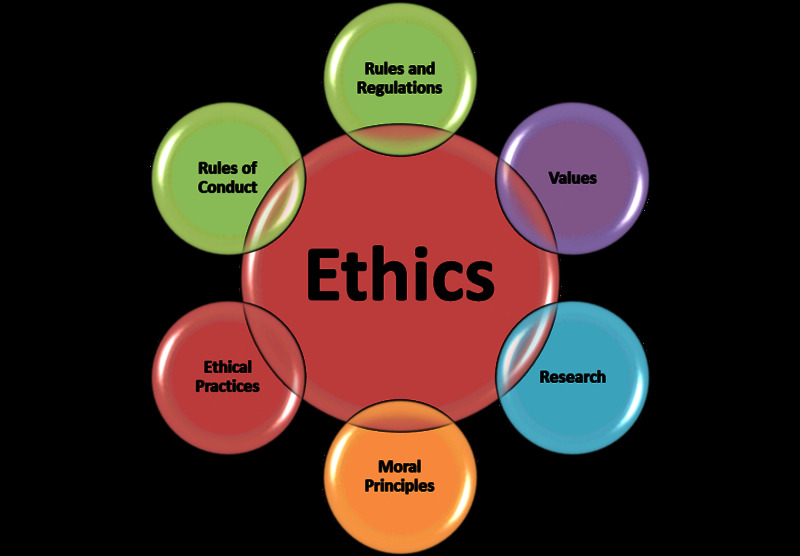 Some bees in a group were trained to pull a small wooden ball along a pathway and into a marked circle (the "goal post"). As soon as a bee scored a goal, the experimenter placed a drop of sucrose in the circle for the bee to drink. 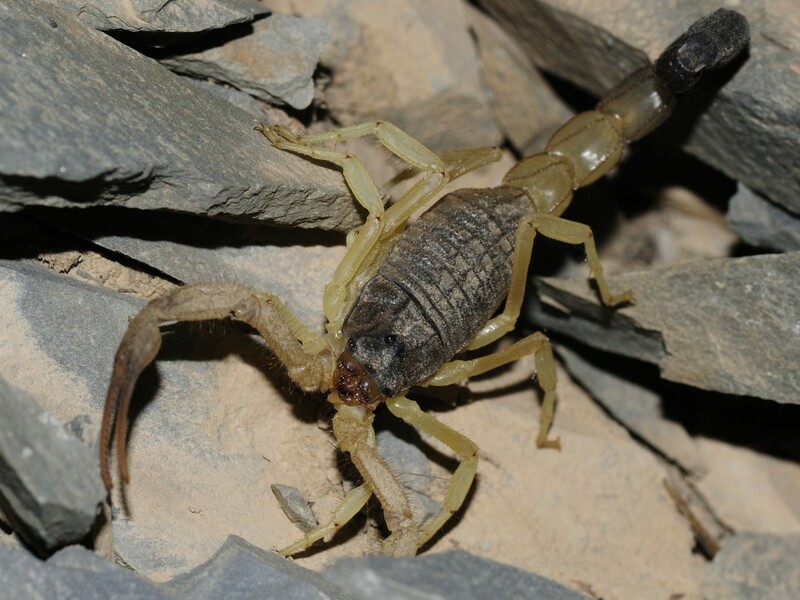 The training period took around five hours, not including rest times for the insects. Training techniques included moving the ball in the correct direction with a fake bee attached to a stick and via a moving magnet under the surface of the "soccer field". Untrained bees who watched a trained soccer player needed to see only three goals before they could perform the task themselves. The untrained insects reached the goal "almost every time" after their observations, according to the Nature article referenced below. Bees with no training and no opportunity to watch experienced insects scored a goal about 30% of the time. These miniature brains can accomplish a lot more than we thought. In an experiment described in 2016, the researchers discovered that bumble bees can also learn to pull a string to get a reward. The experimental setup was as follows. Three blue disks containing a well with a sucrose (table sugar) solution inside were placed in a row. The disks were covered by a plexiglass table that was raised slightly off the floor. The gap between the table and the floor was too shallow for the bees, so they were unable to reach the disk and its sucrose. A piece of string was connected to each disk and ran under the table to the outside world. Pulling this string brought the disk to the edge of the table and made the well accessible. Some bees were trained to reach and drink the sucrose. At first there was no obstruction between the insects and the disk containing the sucrose solution. The disk was then gradually moved further and further away from the bees until finally the only way to reach it was to pull it by the string. Some bees weren't trained and were immediately presented with the experimental setup described above. Only two of 110 bees pulled the string to reach the disk. Other bees that hadn't been trained watched the trained bees pulling the string and drinking the sucrose solution. As a result, sixty percent of these untrained bees pulled the string on their first exposure to the setup. Interestingly, even when the first bee who was trained to pull the the string died, the technique continued to be passed from bee to bee through the colony. String-pulling became part of the colony's behavior. It's often hard to know for certain what emotions another person is feeling, let alone members of another species. There is evidence suggesting that bumble bees may experience a sensation akin to optimism, however. Once again, research into this topic was carried out by scientists at the Queen Mary University of London. The university has a group of scientists who are very interested in bumble bee abilities. 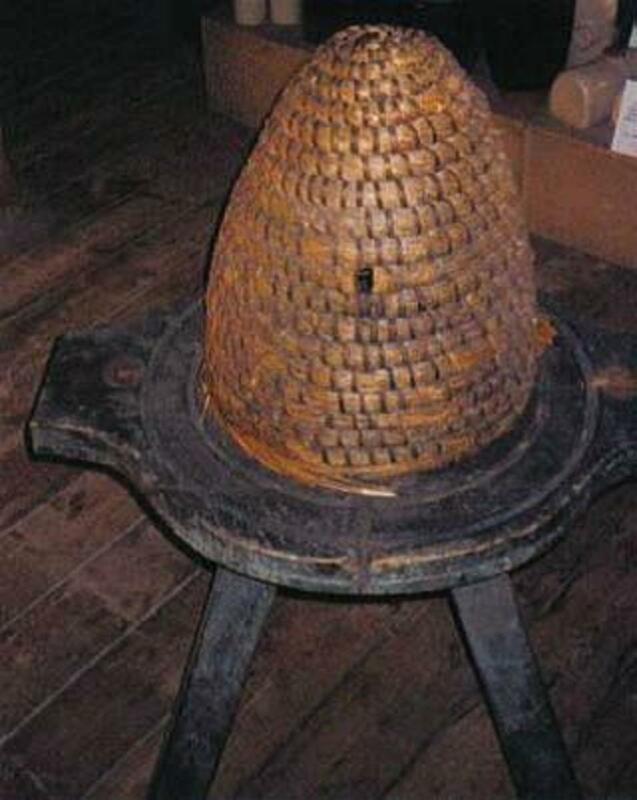 The researchers trained twenty-four bees to travel through a metal cylinder and into a closed chamber. The chamber contained four tubes. One of the tubes had either a green or a blue tag. A green-tagged tube contained water. A blue-tagged tube contained a 30% sugar solution. The bees needed to enter a tube to drink the liquid. They learned that the blue-tagged tube was a rewarding place to visit. The bumble bees that have been studied have trichromatic vision. They see best in the UV, blue, and green regions of the electromagnetic spectrum. In the next stage of the optimism experiment, the researchers replaced the blue and green-tagged tubes with one containing a tag of an intermediate and ambiguous color. As the bees entered the metal cylinder on their way to the chamber and its tubes, half of them received a drop of 60% sugar. The other half received nothing. The researchers found that the bees who had received the sugar gift took less time to enter the ambiguous tube than those who received no gift. This suggested that they might be feeling optimistic about what they would find in the tube. In order to negate the possibility that "optimistic" bees were reacting faster due to the effect of the sugar on their general physiology instead of on their brain, the researchers treated some of the bees with a dopamine inhibitor. This blocked the reward center in the brain and stopped the bees from displaying optimistic behavior. Dopamine is involved in the reward system in the human brain as well as in the brain of bumble bees. The popular press often refers to bumble bee "intelligence" when they discuss the interesting discoveries that are being made about the insects. Scientists are more cautious about using this term. In general, bumble bees must be trained to solve a problem in the lab, although a higher number of bees solve a problem on their own in some situations than in others. It could be argued that the insects must have a certain level of mental development in order to be trainable, however. Some scientists have pointed out that it's hard to design a suitable intelligence test for animals that have different senses, physical abilities, and lifestyles from humans. Others have noted that we may be biased towards those animals that are most like us when we decide to classify an animal as intelligent. Still, the idea that an insect can exhibit intelligent behavior is controversial. There is less controversy about the discovery that bumble bees can learn and pass on their knowledge to their companions. The transfer of skills may create a rudimentary culture. It's uncertain how applicable lab discoveries are to the everyday life of bees in the wild, however. I'm looking forward to seeing what else scientists discover about the capabilities of bumble bee brains and of the brains of other insects. The discoveries so far are very interesting. Hi, ata1515. Bees are so important in our lives. It's always interesting to learn more about them! Interesting news about one of our most important insects! Hi, Peg. Thanks for the visit. Bumble bee behaviour is certainly impressive! This is fascinating information about such beautiful creatures. I loved the photos in their depth of color and detail. Amazing that they can learn specific behaviors. Who knew? It was really interesting to learn of the bumble bee's alternate names, particularly, dumbledore since that is a prevalent name in the Harry Potter fiction novels. It would definitely be wonderful to communicate with other life forms as you describe! Thank you for the comment. Would it not be wonderful to be able to establish some mode of communication with other life-forms to understand their perception of the process of living? Interesting article about an equally interesting fellow creature. Hi, Catherine. Yes, bees are amazing. I'm very impressed by the recent discoveries about their behaviour. I certainly agree with your statement that we tend to underestimate the abilities of many creatures! Bumble bees are truly amazing as are their cousins, honey bees. (I've written about the intelligence of honeybees and they seem similar to bumble bees. ) We tend to underestimate so many of the other creatures on this Earth. If bees had a brain the size of a human brain, I think they would have so much intelligence that it is humans who would seem to be as limited as an insect. Hi, Colin. Bumble bee behaviour is certainly surprising. It's impressive, too. Thank you for the visit. Wow! I did not realise bees could learn to do such things. The pulling of string to get to the sugar-based compound etc. Especially passing the knowledge on after the first bee to learn had died. Very interesting. Also about experiencing a form of optimism. I agree, Augustine. Bumble bees have very interesting and sometimes surprising behaviour. I appreciate your visit and comment. I find bumble bees to be completely fascinating! Thank you for sharing. I agree! It's fascinating to think about the abilities of bumble bees. What fascinating studies! And what a great job those scientists have. I was particularly struck by the experiment in hope. Thank you very much, Jackie. Nature is definitely fascinating! As you say, there is so much to learn. This is so very interesting Linda and I was just reading about bees at Facebook yesterday too that verifies their intelligence. Live and learn, huh? So much we do not know and I love learning it, thanks to you and those like you who bring us such knowledge of particular interest. Thank you for reading the article, Vellur. I appreciate your comment. 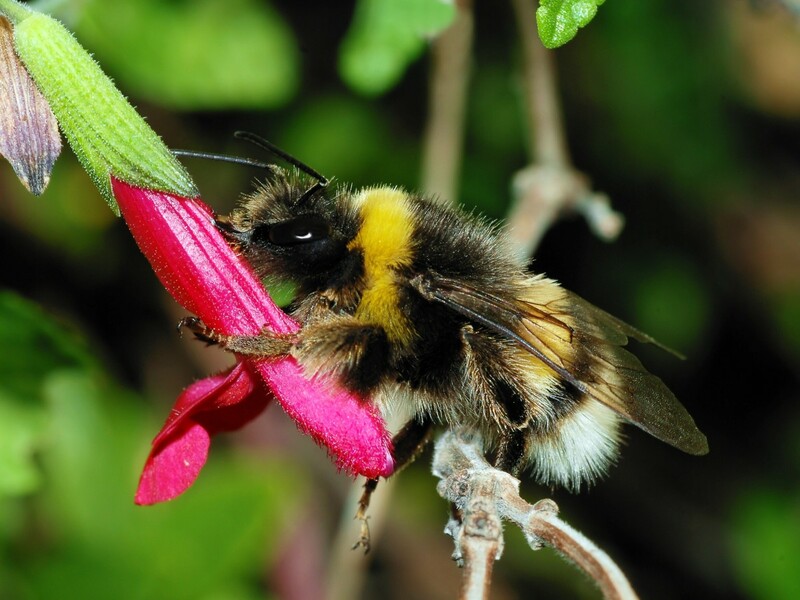 A fascinating and an interesting article about the behavior of the Bombus terrestris. They are smart and optimistic! Enjoyed reading. Hi, Devika. I think that many people may be seeing fewer bumble bees than they used to. It's a sad situation. Thanks for the visit and comment. I noticed fewer bumble bees in the garden. Saving bumble bees is important to our society. Informative and well-researched. 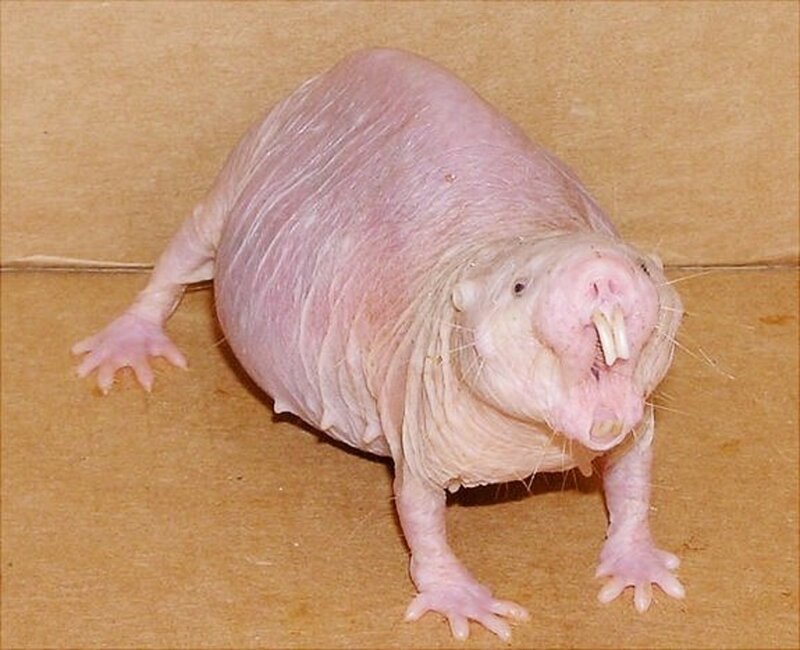 I have the same reaction to the discoveries, GalaxyRat! Hi, Flourish. It would be good if we could help bees. They certainly need our support! Soccer? Pulling strings? Wow! These creatures are so smart! I wish we had a top 10 list for how we can help them. Thanks for the comment and for sharing your opinion, Dora. The discoveries about bee behavior are definitely amazing. I'm looking forward to seeing what is discovered next! Linda, your articles usually make me go "Wow." Discoveries like "Untrained bees who watched a trained soccer player needed to see only three goals before they could perform the task themselves" suggest intelligent behavior in these creatures. In my humble opinion, it also suggests an Intelligent Creator. Thanks for these amazing facts. Thank you very much for the comment, Manatita. The nature of intelligence is an interesting topic to consider. I hope scientists learn more about it soon, especially as it operates in animals such as insects. A very fascinating and very well written article. Interestingly done. I feel that bees are very industrious, like the ants and in their own way, intelligent too. Perhaps one day we'll understand how the animal intelligence develops. I'm sure that they work with a plan like humans. Great work!! I agree, Larry. There are some amazing animals in the world! I appreciate your visit and comment. Per body size there are some amazing creatures in the animal kingdom! Hi, Rachel. I think that the bees are fascinating, too. It's very interesting to think about what's going on in their tiny brain! 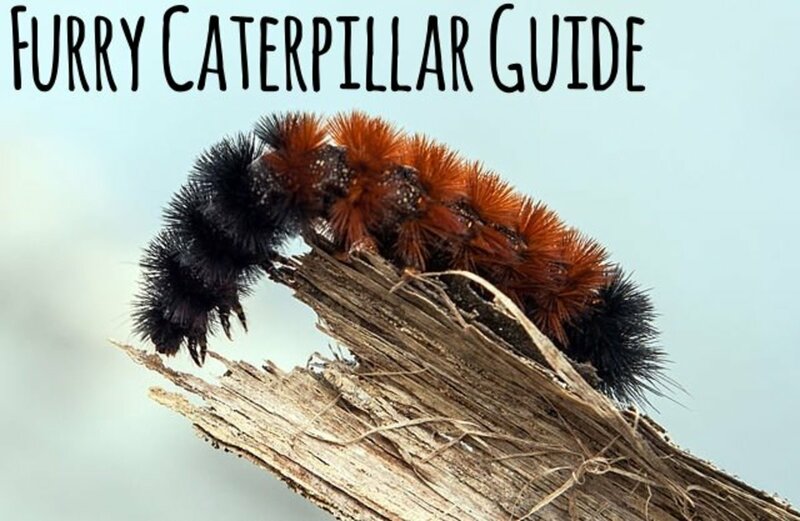 Hi Linda, I always found bumblebees fascinating and this hub and videos prove it. I love it and never thought that they could be trained. Thanks for sharing all of this information. Thank you, Martie! I find the information amazing, too. This is absolutely amazing! Who would have thought bumble bees are so intelligent? Thanks for this most interesting information about the Bumble Bee, Linda! Thanks for the comment and the pin, Peggy. I have a vague memory of the term humble bee from my early childhood, but I've always called the insect a bumble bee. Its ability to learn is certainly impressive. Your articles are always so informative Linda. Pinning this so that I can refer back to it when I wish. Never had I heard the term dumbledore or humblebee for bumblebee. They certainly are smart creatures. We all need for them to survive. I agree, Penny! The fate of the bees and our fate are linked. Thanks for the visit. That is just amazing! Let's hope we can save them, and in the process, ourselves. Thank you very much, Bill. I appreciate your kindness. The disappearance of bees is a sad and very worrying situation. I hope they get the help that they need. Always fascinating information, Linda. I loved this article. 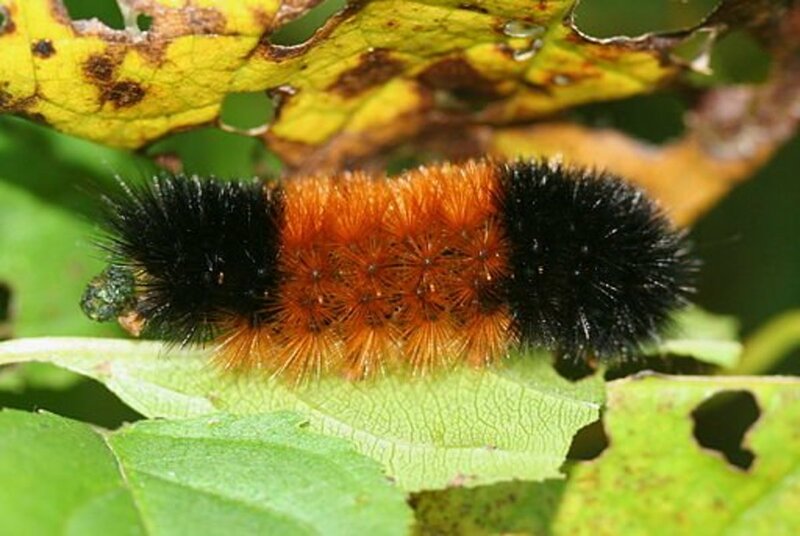 I do know, just from observation, that there are far-fewer of these little fellows than there were when I was a child, and I suspect I know the culprit in that disappearing act.